Home - MCM Wealth specializing in alternative investments for the San Francisco Bay area. Our purpose is to better the lives of our clients. We do this by thinking and investing differently. We specialize in researching alternative investments specifically chosen to perform through all market conditions, including recessions. Our portfolios are designed to significantly outperform the stock market when invested over the full span of a bull, bear and recessionary cycle, growing the portfolio both safer and faster while saving the investor years of time. We apply this approach to our client’s investment and retirement nest-eggs, along with their interests in impact investing, insurance planning and charitable giving. While portfolio growth during bull markets generally happens painlessly, growth during bear markets and recessions is an entirely different matter. 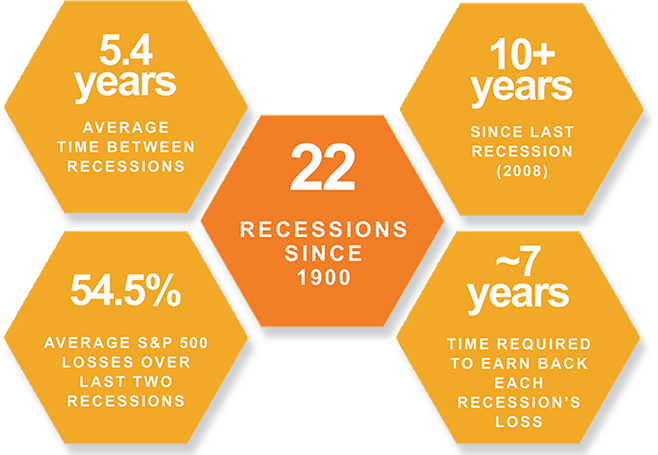 22 recessions have occurred since 1900, occurring naturally and inevitably as world economies rise and fall. Recessions represent the investor’s greatest challenge often creating 50%+ portfolio losses requiring 5-7 years to earn back, a non-productive period that none of us can spare. Results of this sort are costly, stressful and wholly unnecessary. For the first time in recent history stocks, bonds and real estate are now in bubbles leaving investors few places to hide while the next recession approaches. Well researched protective Alternative Investments (AI’s) are specifically chosen to be both defensive and productive in bull, bear and even recessionary markets. While university endowments pioneered the use of AI’s, well selected AI’s have also become the preferred investments for the wealthy and super wealthy as principal preservation, first, followed by consistent growth, is the most efficient way to grow wealth over time. AI’s come in many forms including niche real estate, guaranteed insurance products and private long/short equity & bond funds. More specifically, long/short funds have become our specialty given their unique ability to grow and defend regardless of market direction. We are one of the few firms within our industry specializing in the research and use of AI’s for accredited individuals, families & small companies. Planning for real life is more complex than just understanding how much you can spend on a new home or knowing when to retire or start taking Social Security. Real life requires a broader, deeper approach we call Whole Life Financial Planning. It’s an approach that allows you to consider the big picture. While Whole Life Financial Planning covers planning basics, it also asks you to consider your interests in other topics such as: how to choose investments that are right for you (including both alternative and impact investments), insurance and estate planning, charitable giving and other financial issues that may affect your family and/or business. Our specialty is building portfolios that perform in all markets, so you can relax, make plans you can count on and move forward with your life during all times. We achieve this by researching and creating portfolios comprised of protective Alternative Investments that both protect and perform during bull and bear markets, along with destructive recessions. In addition, we offer a full range of Impact Investment options, from off-the-shelf to fully customized to those that also defend, along with state-of-the-art Charitable Giving tools for getting you where you want to be most efficiently, least expensively, and with maximum control. You’ve worked hard and invested wisely to grow your portfolio and build an estate you’re proud of, but much of your diligence will be lost if you fail to plan for its passage. We offer comprehensive estate planning solutions custom-tailored for estates of all sizes. Our in-house legal services are offered on a flat-fee basis with you in full control of the level of planning that best achieves your objectives. Proactive legacy planning is built into our estate plans as well. This assures your values are preserved and passed to your loved ones, including your wisdom, family history, spiritual values, and intellectual and human capital, enabling your heirs to manage the responsibilities of their inheritance. Few of us enjoy thinking, talking or reading about our insurance needs. It’s just too unpleasant and represents another cost that many of us question. Nonetheless, most of us must succumb, as inadequate insurance planning represents a risk to family members that is too just real to ignore. At MCM Wealth, we’ve found a solution that significantly reduces premium costs, while increasing policy productivity, creativity and flexibility. As fee-only wealth managers, we offer fee-only (versus commission-based) insurance. Fee-only makes all the difference, providing a much better way to get the job done for clients.